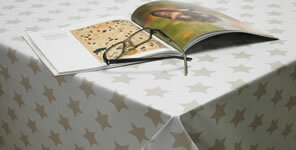 Offering freshness to any room our range of White PVC Vinyl and Oilcloth Tablecloths are ideal for any occasions. Whether for a wedding, christening or birthday party there is a design here for everyone. As with all our wipeable tablecloths we can cut them round, square or rectangular. We can also fit a parasol hole, fit bias binding to the edges and also make extra-wide tablecloths to order. If you don't see the design or size you require ensure you contact us so we can advise you on what is available.